Joshua Colp is no stranger to the pages of AeroGeeks.com. The owner of Culprit bicycles, Josh is a constant innovator. Just over a year ago we shared his Covert Ops Launch and as part of the launch reviewed his P.E.R.K. saddle bag. Before that (way back in 2015) we looked at the Culprit Legend. At the time the Legend was truly revolutionary – disc brakes, integrated frame storage, and no seat stays. Yes, now we take all of that for granted but back then it was pretty revolutionary. Well, Joshua is back at it again – this time with his new Culprit RAD launching on Indiegogo today. RAD is a full carbon monocoque carbon frameset made using EPS technology so there are no voids or wrinkles inside the frame. The frame is designed to fit 45 mm 700 C tires or 650B 2.1 inch tires. Fenders can be mounted with up to 32C tires. Front/Rear Panniers can be mounted with racks (25 Kg max on rear panniers, 9 kg max on front panniers. 27.2 carbon seat post included with internal wedge seat clamp. Compatible with dropper posts. For your hydration needs you can fit 3 bottles on the front triangle. 2 inside the front triangle. 1 on the bottom of the down tube. A Bento box on the top tube is also included. For those wondering about aero, there is fully internal routing with 2 cable entries for any cockpit to work. Top tube cable entry or through the steerer into the frame. 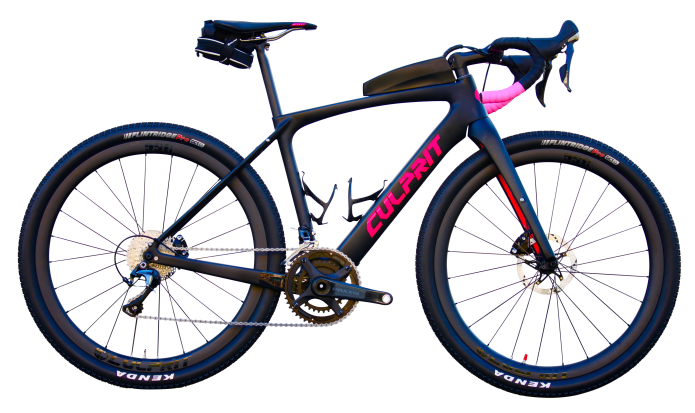 Colp found in the wind tunnel that a wider fork crown with better air flow around the wheel led to better aerodynamics. So you don’t need to worry about the extra space when using a smaller tire size below 45 mm. The RAD will be available in 5 sizes, XS, S, M, L, XL. At launch there will be 3 color options. Carbon/black, Carbon/Neon yellow, Carbon/Neon Pink. 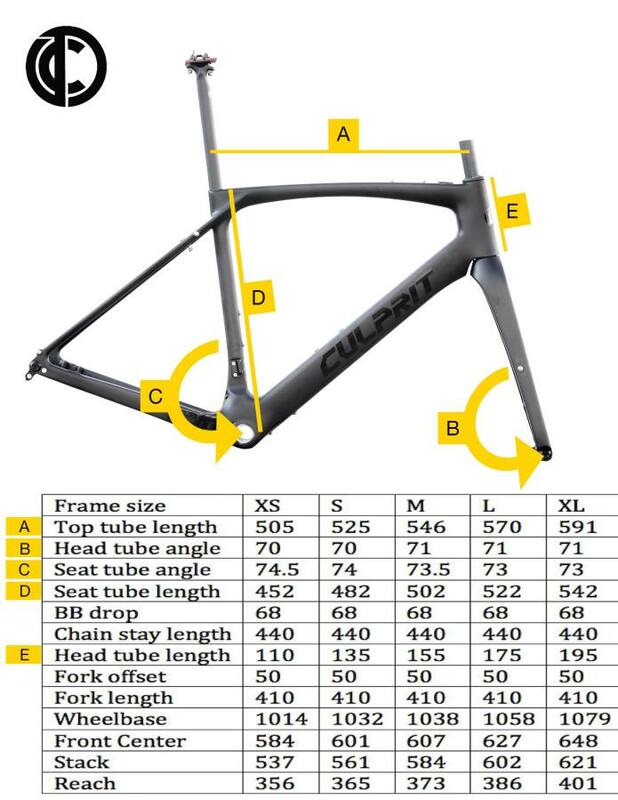 An unpainted 55 cm frame weighs in at 1210 grams. 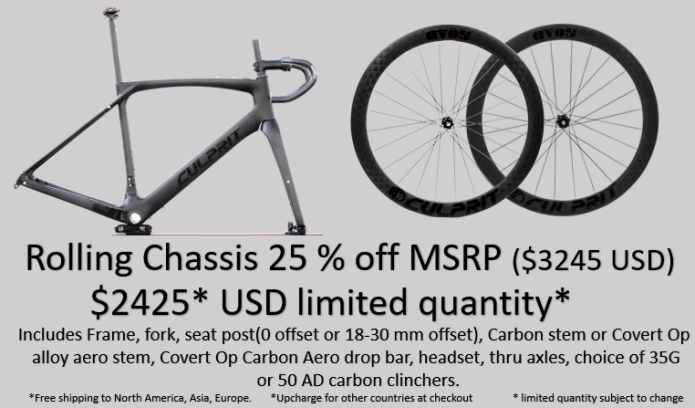 You can buy the RAD as a rolling Chassis including your choice of 50 AD 700 C carbon clinchers or 35 G 650 B carbon clinchers. Or you can get the wheels alone. Both wheel options are built using Tokens D1 hubset. Weighing 87 grams for the front and 240 grams for the rear, straight pull 24/24 with centerlock design. Tokens expertise is with bearings and these hubs are designed to ride any terrain. As we mentioned the RAD and AD wheelsets just launched this morning. 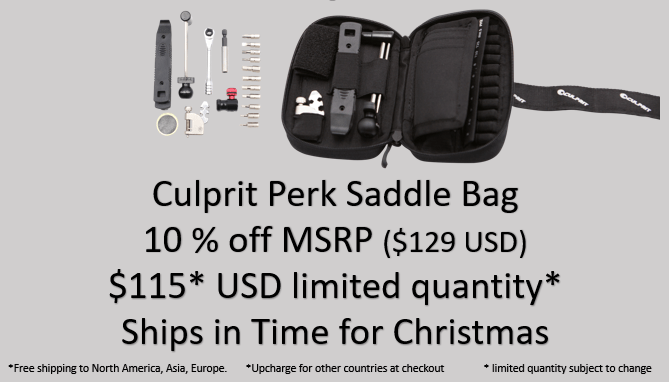 The campaign starts at the lowest level with the PERK saddle bag – with planned retail at $129 you can get it for $96. 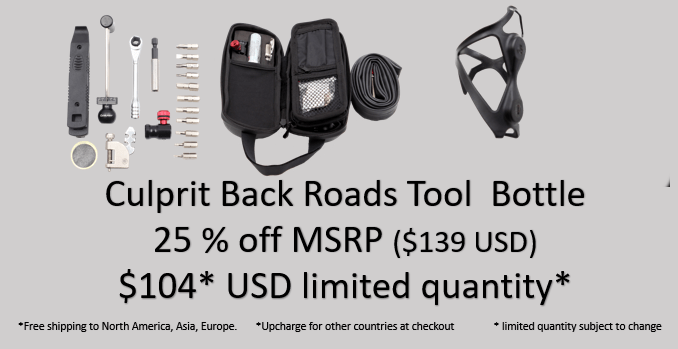 For those looking to hold a little more there is the Culprit Back Roads tool bottle. It comes loaded and includes a bottle cage that results in a bag that stays put no matter how rough the terrain. 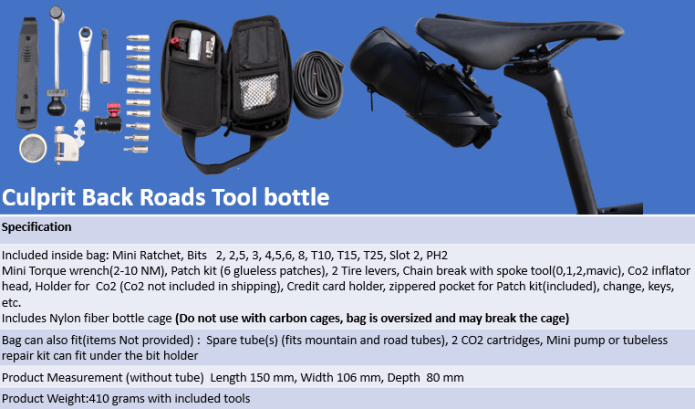 All the tools, parts you need in an easy to carry bottle shaped case which is easy to move between bikes. You can get it for $104 (the MSRP is $139). 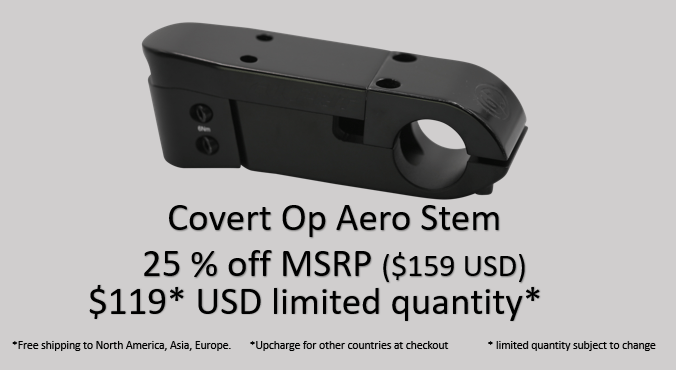 There is the Covert Op Aero Stem – with planned retail at $159 you can get it for $119. Next up are the Culprit 50 AD Carbon Wheelset and 35G Carbon Wheelset. Both have planned MSRPs of $1250 but with the campaign will be available for $940. The RAD itself will be available in 3 configurations – frameset, frames with cockpit, and rolling chassis. 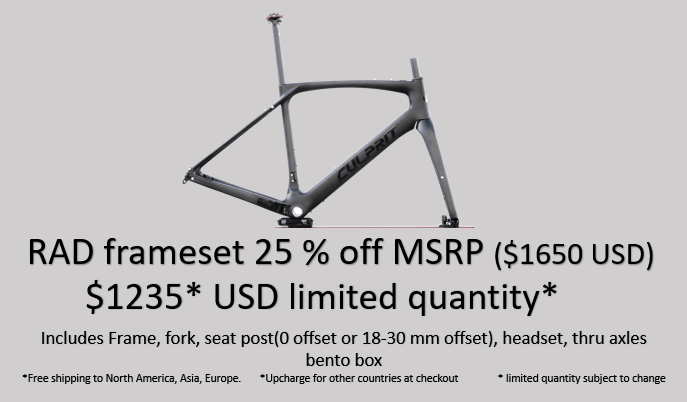 The frameset (with fork, seatpost, bento box, headset, and thru axles) will retail for $1650 but is available for $1235. 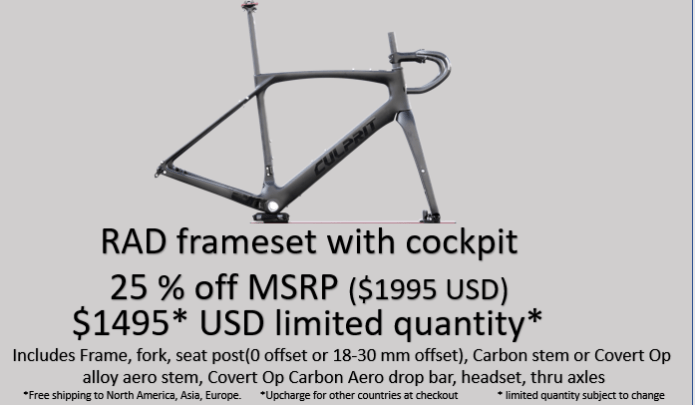 The RAD with cockpit (everything that the frameset came with plus with a carbon or covert ops aero stem and carbon aero drop bar) will retail for $1995 but as part of the campaign is $1495. Lastly the rolling chassis adds your choice of either the 50 AD or the 35G wheels to the RAD with cockpit. And can be yours for $2425 (retailing for $3245). Joshua Colp is someone that when he sees a challenge, or an opportunity for improvement in the industry, he is not going to sit back and wait for someone else to solve it for him. Instead he is going to create a solution and work to get it out to the market. The RAD is a perfect example of this. He wanted a bike that he could ride on the road, commute to work, and take on the gravel trails. So he went and developed one. 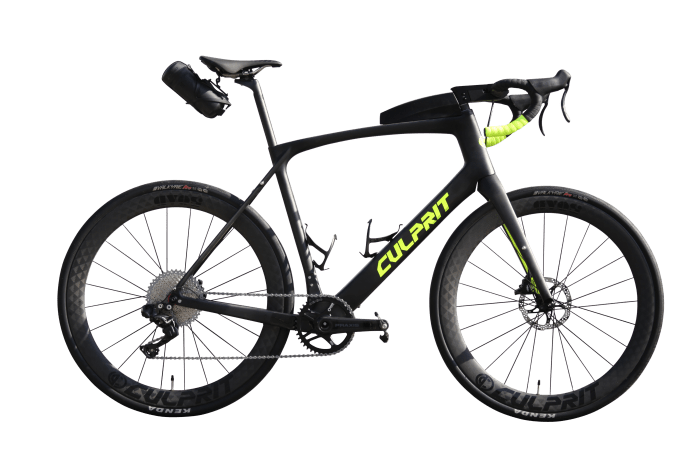 At $1995 for the frame and cockpit the deal is pretty fantastic. Head on over to the campaign page to see the RAD up close and determine if this is truly the N+1 bike you have been looking for.